Watch Broadway Style Live theatrical performances. Entertainment plus dining. DRESS CODE: Men should wear long pants and collared shirts, but no ties or jackets are required. CANCELLATIONS Accepted by noon for evening performances, and 10:00 am for matinees to receive a rain check. For refunds, cancellations must be made 48 hours prior to the performance. 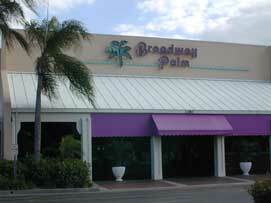 Broadway Palm Dinner Theater prefers collared shirts and long pants for gentlemen. No shorts or t-shirts.